There are some times where we want to be healthy. Healthy times are rare times, however of course there would be this really hip asian fusion soul food that is VEGAN / VEGETARIAN in our greatest city ever. A small intimate dining area – Red Bamboo would be an ideal date spot. I am stuck between a 3.5 and a 4, but I will give a four. Being a meat-eater, I was super skeptical that I would enjoy this vegan fake meat thing. 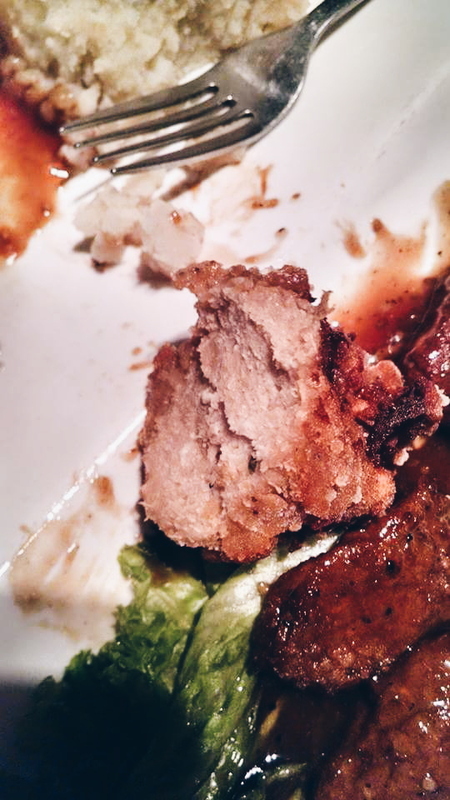 To my surprise, the “fried chicken” was really delicious and it even had the similar texture that fried chicken does have – including the resistance of the meat once you bite into it. How they do it? I have no idea, but it sure does taste good and you can trick your mind that you’re eating meat. However, I was disappointed with the fake “beef” because it was really chewy and did not taste like beef at all. The constant chewy factor really made me a bit nauseous after a while, so I don’t recommend having the dante dish. Be sure to try the fried chicken though. I will probably come back again to try more of the different “meat” dishes – just definitely not anything “beef”. If I were to become vegetarian, I believe I’d rather eat real veggies compared to really screwing up with my taste buds and brain. Veggies are veggies… meats are meats!! Be aware that the dishes will definitely get you full, even though they aren’t meat! haha. If you’re a long time meat eater, the first few bites will really throw you off. To be honest, we came here in hopes of searching for some good ol’ soul food (it’s funny… because we weren’t anywhere near harlem). I completely overlooked that this was an vegetarian restaurant because I really just wanted fried chicken and saw that it was on the menu. We NEVER eat at vegetarian places, so this is completely brand new to us. We weren’t really sure what to expect. I mean I had veggie patties and that kind of stuff in college before, but imitation meat? That’s just crazy. As noted before, I just wanted FRIED CHICKEN!!! So as you may have guessed, I ordered the Southern Fried Chicken and it came with sweet potato fries and collard greens. The first bite was so unreal. Like I said before, it just completely threw me off. I just started to question life altogether. It literally tasted like real chicken. The texture was right, albeit a bit a dry though, but everything about it just seemed correct. After a couple more bites, my taste buds just weren’t as receptive as the initial bite. The more I ate the faux meat, the more it my body wanted to reject it. It became a struggle to finish it for me. I’m not here to bash on faux meat, but personally, this was my experience. I think Red Bamboo did an awesome job with these dishes and I’m sure I would have loved this if I was actually vegetarian, but you really can’t fool your taste buds with soy “meats”. I give it a 4 out of 5 too! 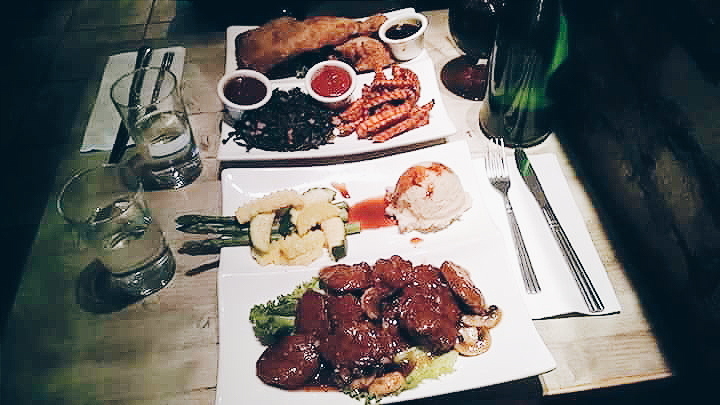 Posted on October 8, 2015 October 8, 2015 by pinkytwinkieeePosted in New York, Vegan, VegetarianTagged dinner, fake meat, food, lunch, not meat, nyc, Soul Food, Tofu, vegan, vegetarian. Previous Previous post: Happy October! Next Next post: We got engaged!